Arlington County has published two new reports highlighting significant disparities in health and well-being among residents, as well as strategies to reduce those disparities. A Decade of Difference: The Destination 2027 Steering Committee Report identifies actions to take to address the fact that who you are and where you live in Arlington can make up to a decade of difference in how many birthdays you celebrate over a lifetime. Arlington Partnership for Children, Youth and Families (APCYF) 2019 Community Report calls attention to disparities in the health and well-being of children and youth based on factors such as income, race and ethnicity, sexual orientation, gender identity, and level of English proficiency. Arlington rightfully celebrates being highly ranked in many areas, like employment, education, and health. However, looking beyond aggregate data and drilling into results in different geographic, ethnic, racial, and other often-marginalized groups reveals that health disparities exist among Arlingtonians in these groups. Not everyone is thriving. 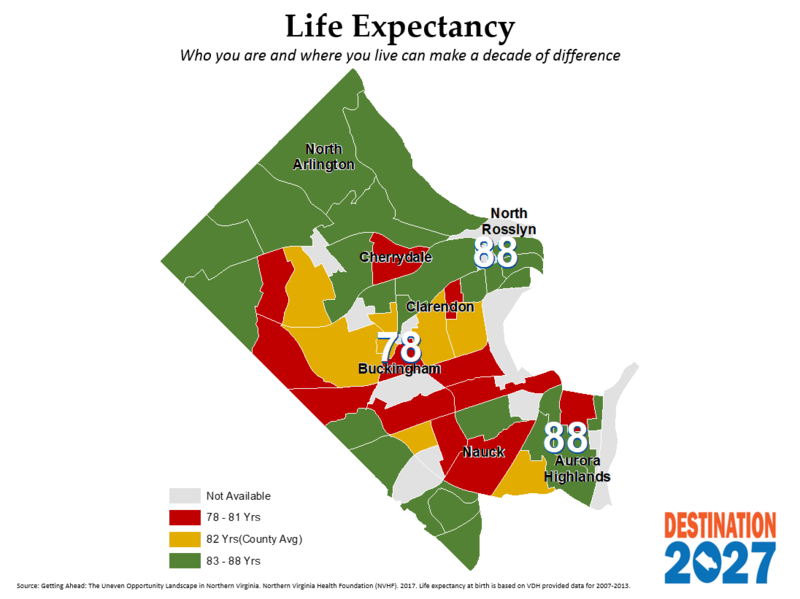 Life expectancy varies by up to 10 years among neighborhoods. Economically disadvantaged youth who attended a private or APS pre-K program met the fall PALS benchmarks, a test of early literacy, at a rate much higher than those who had no formal pre-K. The percent of children living in poverty is up to 5 times higher in certain neighborhoods. The teen birth rate for Hispanic residents is 11 times higher than it is for White residents. Black residents are 8 times more likely to be hospitalized for asthma-related conditions than White residents. The number of youth who said they received the help they needed for depression was so low for Black and Asian youth that a percentage could not be reported. The 2019 Community Report presents the story of Arlington’s children, youth and families through data. Its topic areas align with the Whole School, Whole Community, Whole Child framework, which focuses on ensuring each child is safe, supported, healthy, challenged and engaged. Each indicator page summarizes the findings, provides context and presents key supporting data. The Community Report was developed to stimulate data-informed reflection and, where needed, action throughout Arlington. Areas of concern identified in prior reports have sparked new initiatives and strengthened existing actions taken by key stakeholders, including APS, Healthy Communities Action Team, Child and Family Services Division, Public Health and numerous non-profits. 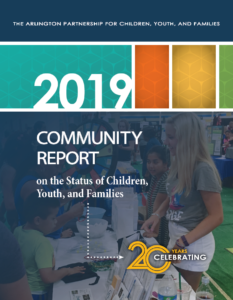 “In this 2019 Community Report we have worked to disaggregate the data to ensure that disproportionate findings are not hidden in the use of averages,” said APCYF Chair Sheila Fleischhacker. “This will help the community use the data more intentionally, targeting areas or populations that are in most need. For example, issues of mental health, bullying, adult support, and early childhood experiences can now be discussed through an equity lens. We can now, one, determine who is reporting what, which helps when we consider the why, and two, then tailor strategies to address the specific need. This data-informed approach will move us from one-size-fits-all attempts to address issues (equality) to needs-based strategies (equity) that focus on small sub-populations across schools, the County, and the greater community,” Flesichhacker said. The first stage of Destination 2027 was a year-long process that focused on identifying disparities in health to create a plan to achieve health equity by 2027. Health equity exists when everyone has access to the conditions needed for optimal health and well-being. Now that the plan is in place, a Destination 2027 Implementation Task Force will move the work forward by fostering systems change in the government, non-profit and private sectors. The Arlington Partnership for Children, Youth and Families (APCYF) is a community-led advisory group composed of 16 appointed community members, eight designated Arlington County Government and Arlington Public Schools staff, and other interested parties. Its mission is summarized in three words: research, engage, advocate. The group identifies community needs through research and surveys; engages the community to find ways to meet the needs; and advocates for improved policies and programs.